South Pacific Familyadventure 2008 - The family:Felix,Carolina,and Gabriel.Here on the North Sea July 2005(picture). Title: The family:Felix,Carolina,and Gabriel.Here on the North Sea July 2005(picture). When the children were small,the family had a former small navy patrolboat used for divecharter.The children spent some summers onboard that former navyboat that was sold 1997.In May 2000 Tarita was bought,and sailed from Lymington(near Southhampton ,UK) to Stockholm.Since then the children have spent the majority of their summervacations onboard Tarita. Felix,who is 15 years old, started to sail dinghy(optimist)at the local boat club in the spring 2001.He got very devoted to racing,and finally reached his goal to be a member of the national team,and race in the Nordic Championship(all Nordic countries) in Åbo(Finland) 2006.In that race he ended up as number 12,one of his better achievements so far.Felix is in his last year of primaryschool,and has applied for a high school in Motala(150 km south) which is one of Sweden´s two high schools for training sailors,apart from ordinary high school studies.This summer Felix was certified as a CMAS scuba-diver. Carolina is 14 years old,and started to sail dinghy like Felix at the local boat club.She has participated in several races(optimist)on a district level,but has never been devoted to racing like her older brother.Last summer Carolina participated in a sailingcamp at Vitsgarn,a navy sailingcamp for teenagers.That kind of “scoutsailing” appeals more to Carolina than racing.In her freetime,Carolina is most interested in dancing,and runs dancing classes for younger children together with her friend Joanna.On January 19,Carolina will start a CMAS certified scuba diving course. 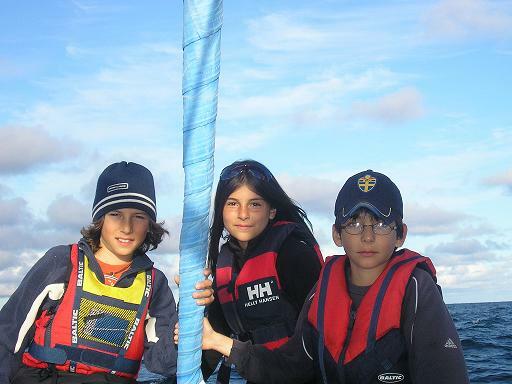 Gabriel is 12 years old.Like his older brother and sister,he started to sail locally with optimist,and has participated in several races on a district level.He has never been really devoted to dinghy sailing,but on the other hand,he is completely passionate about football(socker).He plays football in his room(!? ),on the football court outside our house,and is a devoted teammember of the Trosa Football team for boys born 1995.In his bookshelf are mainly books about football,and Gabriel is a keen reader of the football magazine Gold.He is a keen snorkeler,but is still to young for Scuba.